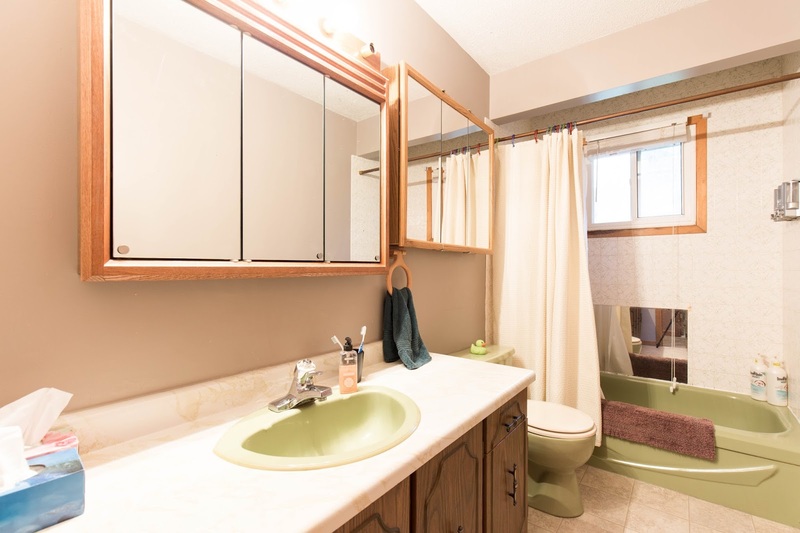 The Canadian Housewife: Good Bye Green Bathroom, Hello Mess! Good Bye Green Bathroom, Hello Mess! Remember me? That girl who said she would faithfully blog about all the exciting house renos? 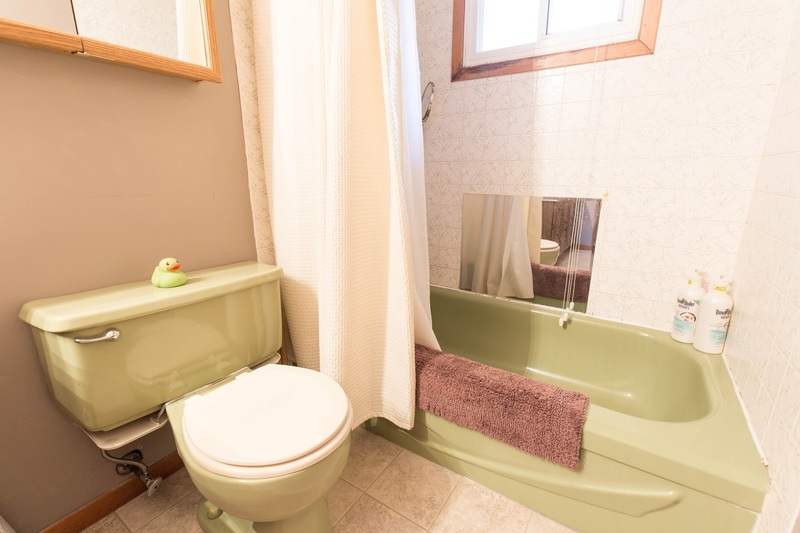 Well here I am, fulfilling that promise with the first post on our first big house reno: the avocado green bathroom! I almost forgot how incredibly green it was. Or what it was like to have a decent bathroom to use on the main floor. Ah, the good ol' days. Seems like just yesterday that we were enjoying using our 70's bathroom and joking about how stylish it was. While in fact, we only really got to use it for a little over a week before we madly tore it apart. That's right, we didn't waste any time starting this project. We started with taking down the walls that had to go and opened up the space a lot more. We plan to turn this one bathroom into two, an ensuite for the master bedroom and a powder room for guests. Because of these plans, we needed more space and chose to remove the closets from the bedroom and the linen closet from the hallway and combine it all together. We felt really good about our first day of work and were excited to see how this project would unfold. Our next attack involved removing the vanity, toilet and bathtub. The vanity and toilet weren't so bad, but the tub was a whole other story. Mostly because of the crazy old tiles that were glued on and could only come off by shattering them. Dan was responsible for the tile removal while I wandered around pulling trim off the walls and removing extra nails/screws. Guess who had the easier job? I was totally keeping him company though. Oh and remember that weirdly placed mirror in the bath from the above photo? It was put there because there were some broken tiles behind it and instead of fixing them, they just glued a giant mirror awkwardly into the shower. Nice eh? And can I just take a moment to point out what colour the walls were originally? GREEN! These people painted the walls green and then installed a green tub, toilet and sink! I couldn't get over the ugliness of it. But then I reminded myself that it was in style back then and they probably loved their nice pretty bathroom. And then I got to thinking about how 40 years down the road people will probably be thinking the same thing about our decorating. Funny thought, eh? Once the drywall was all down and the tile was finally removed, we had the fun job of taking up the floor. And when I say we, I really mean Dan, because lets be honest, he's doing most of the work on this renovation. The first layer of floor came up well, in nice big chunks that were easy to remove. The second layer? Not so much. Dan pretty much had to chisel away at it and shred it to be removed. We also discovered the original flooring, which I thought would have looked lovely with the rest of the green themed bathroom. It was after the floor was up that we took time for a mini celebration, since we were officially finished the demolition part and could start the rebuild part! We did take lots of time to figure out the perfect layouts for our bathrooms though, before putting up walls. This is the part where I kind of slacked off on picture taking. I feel like this is a common occurrence for me, but in my defense, not too much exciting has been going on. Once the walls were up, Dan did the minor electrical, installed the exhaust fans, put in the drains and started water piping. So all the little fiddly things that don't make for great pictures. We are making progress though and I'm getting more and more excited to see the finished product. We are finally at the point where we can start dry walling and then I will get to taking more pictures again. That is where I will leave off for now, since that is basically where we are at in the renos. We have chosen tile and paint colours and the exciting part is now beginning to happen. I will try not to leave you hanging for too too long, but no promises. Anyone else done a full bathroom reno before? Anyone want to commiserate with me on the joys of living in a messy/dirty house? What a lot of work and a lot of mess! I imagine the original green bathroom and flooring was pretty rockin'! And fixing broken bath/shower tile with a mirror sounds like an awesome solution! :P I'll have to remember that! We have been renovating our house since March so I understand what you are going through. We are just about done and are very happy with the results. Good to know that it will be worth it in the end! I can't wait to have a nice bedroom and an awesome ensuite attached to it. I feel like having at least one part of the house finished will make it seem more like home. We redid our master bath two years ago, also taking down a wall into another room to expand the bathroom.. pain to reno, but so glad we did it!! Wow! 6 years of pink insulation walls! I will most definitely not complain about my month. We're really hoping to get the main floor done this year and that way up the value of the house if we need to sell before we get around to the basement. Ever since I was a little girl I wanted to be a homemaker. This blog captures my journey as I live out my dream. I will be sharing my life – from my struggles trying to have a baby to my day-to-day homemaking adventures. I am learning to enjoy every day that I am given and to live life to the fullest. "I Wish I Was Skinny Like You"